This indicator is useful to get a quick overview of the market if you are interested in the current status of stock indices around the world (or other trading instruments). For example, you can also quickly see how small caps (US2000) are performing compared to large caps (US30). The given drawdown might help to decide when to enter into the market, for example if you are interested in long-term buy-and-hold strategies. The default settings are based on IC Markets symbols. For other brokers you probably have to change them. Drawdown from the highest point of the given history in percent. CAGR (Compound Annual Growth Rate) in percent for the last X years calculated from the current price to a 50 week moving average X years ago (if the broker provides that data). 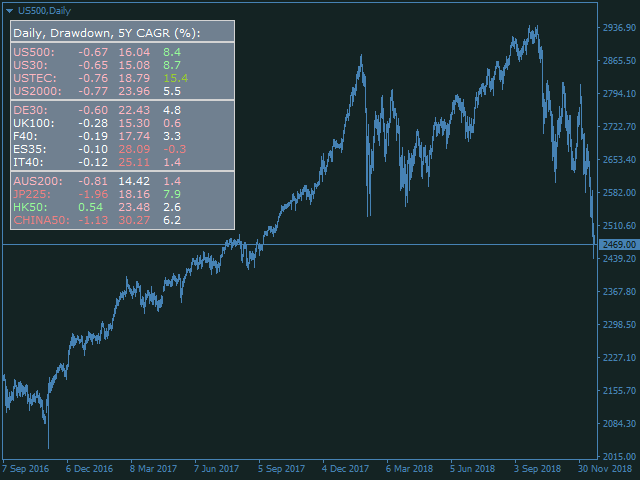 If the values are not showing correctly, it might be necessary to open a D1 and W1 chart for every symbol to force MT4 to load the historic data. Only open it once and close it again afterwards. symbols - a comma separated list of symbols that should be monitored. Must be inserted exactly as they are called at your broker. The default values are for IC Markets. horizontalLinesAfter - a comma separated list of numbers. The Indicator will draw lines after the given rows, which can be used to separate US, EU and Asian stock indices. Added XAUUSD and XAGUSD to the list.